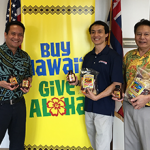 HONOLULU—The state Department of Business, Economic Development and Tourism (DBEDT) congratulates Jimmy Chan, president of Hawaiian Chip Company, for being selected as SBA’s Exporter of the Year for the City and County of Honolulu by the U.S. Small Business Administration District Office. The award recognizes the Hawaiian Chip Company, as it finalizes its deal for the sale of six tons of its Kilauea Fire Hot Sauce to Japan. Chan got his exposure to the Japanese market after participating in the Tokyo International Gift Show (TIGS). Since 2011, DBEDT has organized a Hawaii Pavilion at TIGS, recruiting Hawaii companies to fill the booths and find opportunities to export their products. For the past five years, DBEDT has increased exports from Hawaii by more than $40 million. In September 2017, there will be more than 70 Hawaii companies participating at TIGS and the Hawaii Pavilion is already sold out. TIGS is the premiere overseas trade show, and the largest made-in-Hawaii product Pavilion ever at a trade show. With a record of more than 70 companies participating in the fall, the upcoming Hawaii Pavilion is the biggest representation of Hawaii companies yet, and should help Hawaii achieve tremendous export results.